This Saturday, it’s that rarest of things: a really good reason to be in Manhattan on a weekend. 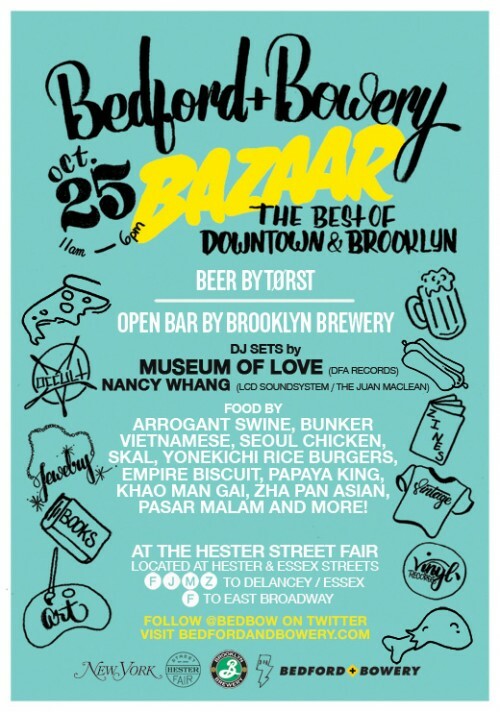 Bedford + Bowery – New York magazine’s site covering North Brooklyn and Downtown Manhattan – is bringing together the best of both worlds for an outdoor festival of food, shopping and music. Come for the free beer (while it lasts!) from Brooklyn Brewery; stay for the beats by members of LCD Soundsystem; and sip still more exotic brews from Greenpoint’s own Torst, whose newly Michelin-starred chef Daniel Burns will be serving up duck sandwiches. You’ll also get to try Vietnamese grub from Ridgewood’s Bunker, Malaysian street food from Williamsburg’s Pasar Malam, Japanese rice burgers(!) from East Village’s Yonekichi, Icelandic stews from the LES’s Skal, Korean-American fried bird from the Seoul Chicken, southern grub from Empire Biscuit and lots more. Rad vendors like Etsy NY will be selling vintage clothing, home wares, jewelry, books, and zines. For Halloween, Bushwick’s Catland has all your occult items and Greenpoint’s “Wizard of Odd,” Billy Leroy, will be staging a one-day-only comeback of his famous Houston Street antiques and oddities tent. There’ll be used records – and brand new vinyl from Greenpoint label Captured Tracks. And speaking of music! Your DJs for the day will be none other than DFA Records artists Museum of Love (featuring Pat Mahoney of LCD Soundsystem) and Nancy Whang (LCD, The Juan Maclean). It’s all FREE and happening this Saturday from 11am to 6pm at the Hester Street Fair, at Hester and Essex Streets on the LES. Find more info here and follow @bedbow for updates! Sponsored post courtesy of Bedford + Bowery. “When we arrived Naomi Klein was addressing the crowd. There were about 3 or so thousand people it seemed in the entire park and environs…that kind of thing is hard to tell. There is no public address allowed since the group has no permit to actually be in Zuccotti park, a private piece of property next to the building that houses Brooks Brothers at the base off WTC site. The manner people use to amplify the speaker is that the speaker speaks a line and then it is re-said in concentric circles out from the speaker by the crowd. She spoke for a while about the inequalities in the economic structures and stressed the need for people to remain disciplined and non violent during demonstrations. She also took questions from the crowd. The General Assembly Meeting started at 7pm in a corner of the park and the same manner of vocalizing was used. These meetings happen 2x per day, 1 and 7. There was a facilitating group and several ground rules for participation including an agenda. It is both highly structured and inclusive of anyone there, there is a clear process by which people can be heard and even for perceived violations of the processes of the meetings. The agenda had several reports from working groups: Media, Public Relations, sanitation, Consciousness, Medical, Arts and Culture etc to state what is happening in their areas. The park is broken up into various areas as you probably know from the press: food, media, camping, sacred space for prayer and mediation, a drum area and area for recycling and sanitation etc. The whole endeavor is super duper organized. It is very much bottom up in terms of ideas and input. It would be hard to generalize on the age but the dominant age seemed to be 20’s 30’s although people right up through 70-80’s could be seen. The general message seemed to be a redress of wealth inequality and the “corporatization” of the public and political discourse. The General Assembly meeting was still going on when I departed at 10:15pm which was somewhat painful….kind of like a vestry meeting or board meeting that would never end but at that point it was taken up with people from other occupy movements…..DC and LA etc sharing thoughts and experiences. We spoke to a young man who was up from North Carolina and was part of the Catholic Worker movement. I spoke with a young woman who worked on wall street late every night but said she had been there every night after work for the last 8 days. In another instance I spoke with a young man who was a Roman Catholic Priest who had been silenced in that denomination for various what he called liberal social practices and criticisms of the hierarchy: he said he had been there every day for 2 weeks inspired that he found such a peaceful and hopeful community of people. Bob and I were warmly received by various people who took note of, appreciated and desired greater clergy presence (or people in various Official Religious Garb). All in all an interesting and inspiring evening was had. I also might add that the food that they were cranking out in the food station looked really great. I was tempted to chow down and shouldn’t get too greedy. One serious problem is the issue of bathrooms and people seem to use the local restaurants. I, fortunately am armed with a book an old NY acquaintance wrote which gives you ideas in such situations (enough with the levity, I know). Actually I did find a bathroom at a local bar.